With so many electronic devices keeping us connected, we don't always have the time to charge them all up before we leave the house. 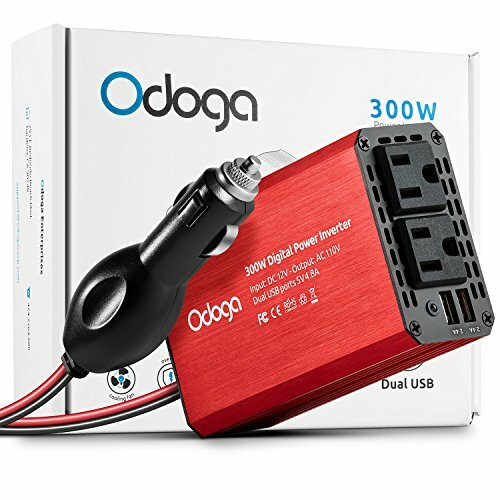 Odoga's car power inverter brings this convenience into our everyday lives. Our car power inverter allows for charging up to 4 electronic devices simultaneously. We've also got you covered with short circuit, over charge, low/over voltage, over temperature protections, built in fuse, auto-shutdown and a smart & silent cooling fan that make our product safe and reliable. Durable, yet lightweight and ultra-compact - Our Aluminum body inverter is the perfect solution to power up your items on the go all in the size of a credit card. • Lengthy cord conveniently allows you to charge from the back seat. • Multi protection for your safety. • Compact, lightweight & portable. • Powerful - Equipped with 2 AC outlet and 2 powerful USB ports, our 300W inverter enables you to quickly charge up to 4 items simultaneously. • Compact, lightweight and durable design - Ideal for us in the car, our ultra-compact car power inverters are designed for use on the go. Whether you're traveling, camping or on your way to work, quickly charge your devices. • Silent - Our smart cooling fan reacts to temperature changes and protects the inverter from overheating. • Safety & Durability - Our device has built in protections again overheating, under and over voltage charging, short circuit & overloads. In addition, its aluminum casing makes it durable and reliable. Join Odoga's family of happy customers today and benefit from awesome products at awesome prices for years to come. If you have any questions about this product by Odoga, contact us by completing and submitting the form below. If you are looking for a specif part number, please include it with your message.